I had enjoyed Kay’s fantasy novel “Under Heaven”, set in a fantasy world heavily influenced by the history of Tang Dynasty China so I was looking forward to the semi-sequel which is set in the same setting several centuries later. In the time period between the two books several dynasties have risen and fallen in Kitai (Kay’s fantasy equivalent of China), the story in River of Stars corresponds to events during the Song Dynasty, although I only know by reading about it on the Internet since my knowledge of medieval Chinese history is very limited (I spent half the novel thinking that the troublesome Northern barbarians who go on a war of conquest were meant to be the Mongols, but apparently they’re an earlier group of invaders). Although the intervening centuries mean that there are limited connections between the books there are some thematic links, the most obvious link is that the way Kitai is being run is in many ways a reaction to the trauma of the events occurring in Under Heaven, particularly the suspicion between the Imperial Court and the military. This suspicion is central to the plot because Ren Daiyan, one of the book’s main characters, believes that his destiny is to rebuild the reputation of the army of the Kitai so that it can regain the occupied lands lost in an earlier war. Much of the book follows Ren’s rise from humble beginnings as the son of a provincial clerk to a position of power via a career as a bandit. The other main character, Lin Shan, also has ambitions that she seems unlikely to achieve, although in her case the main problem is the misogyny of a society that refuses to let woman deviate from their assigned roles. I thought “Under Heaven” had been compelling from the beginning, but had become a bit weaker towards the end as the scope expanded and Kitai descended into war with the book struggling to give a good overview of all that was happening. 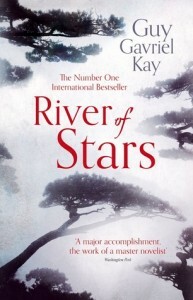 “River of Stars” is the opposite, while the characterisation and world-building is strong from the start the plot isn’t all that interesting at first but it becomes more involving as Kitai comes under threat from its warlike neighbours and it has a strong ending that manages to satisfyingly tie up the various plotlines. I think this is particularly true of Ren’s storyline, to begin with he does come across as arrogant in his certainty that he has a great destiny but he becomes a more interesting character in the latter part of the novel as he has to modify his ambitions to take account of the needs of his country and faces an increasing dilemma in terms of whether he should follow Imperial orders or do what he thinks is right. In the first part of the book I thought Lin Shan was the strongest character, it could easily have been the case that she felt a bit anachronistic in terms of her opinions on a woman’s place in society but I think the book did a good job of making her feel like a product of her society even if she rebelled against many aspect of it. It’s perhaps a bit of a shame that the book focuses on her less towards the end of the story, although she does still get a few moments to shine. The supporting characters are also good, the scheming elderly Prime Minister being a particularly memorable character and I also liked the portrayal of the Emperor as someone who was well-meaning but so divorced from the reality of the world beyond his palace that he doesn’t see how much damage his regime is doing to Kitai, despite being all-powerful he also feels in many ways like an unwitting prisoner. Although this is supposedly a fantasy novel, like many of Kay’s books there is very little magic, but Ren’s encounter with an enigmatic fox spirit is one of the highlights of the book, although Kay rarely uses magic in his stories he is very good at portraying it and mixing myth into his stories. I think the world-building is another one of Kay’s strengths and it is done very well here. The loose ties to Under Heaven are particularly effective at showing the effects of history on later events, and one of the main themes is suggesting that while forgetting history can lead to mistakes being repeated, trying too hard to learn from historical mistakes can be equally damaging. I would probably rate this similar to Under Heaven, although it does suffer a bit from a slow start the ending of the book is very strong and although at first glance there are only loose connections between this and the earlier book I think they complement each other well.